All smiles when our secret white sangria recipe passed the “Wine Eyes” test. Yummy! 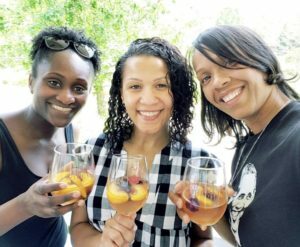 So imagine this, you and your girlfriends or homeboys get together to share the latest “tea” or celebrate another boss-style work week all over a new wine that you picked up. As the beautifully colored wine makes its way into the glass, you can almost taste it. And then…you take a sip and surprisingly it really didn’t “do much” for you. After the third sip, you and your Wine-loving company share disapproving glances. Now you have a full, $20+ bottle of wine that no one favors. What to do, What to do?…I’m so glad you asked, because this happened to me just a few weeks ago. So, I slung on my “Wine Expert to the Rescue” cape and “To Lit to Quit” thinking cap to pull off one of the best Sangrias I’ve ever tasted (if I do say so myself). Try out the recipe below, which features my secret ingredient: Patrón Citrónge. This 70 proof extra fine liqueur will not only entertain your lit-uation, it’ll enhance your experience with its sweet and smooth taste. Patrón Citrónge comes in four flavors (orange, lemon, lime, and pineapple) so get creative! 1 bottle of White or Red Wine of your choice. For White, we suggest a dry and unoaked wine: Pinot Grigio, Sauvignon Blanc, Riesling. That Southern rule of thumb “Measure to Taste,” definitely applies to this recipe. I say start slow combining the above and work to your desired taste. Now, I relied on the whispers from ancestors telling me “that’s enough my child” and you may have that same guidance. I also recommend that you rely on your circle of friends and make this a joint Wine Lovers recipe! Of course, The Lotus & The Vines team can’t forget about our bold, bourbon lovers. We’ve perfected our Bourbon Sangria Punch. 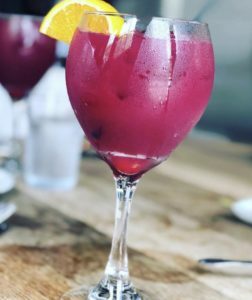 We can’t wait for you to try this goodness in a glass! Pour in each ingredient into a large pitcher of the red wine. Remember to stir as you pour in ingredients. It’s your world, I usually garnish per glass I pour, but some garnish while this masterpiece of a Sangria is still in the serving container. Those are just two of our favorite recipes, but we can only imagine the variety you have. Please share your favorite recipes below.